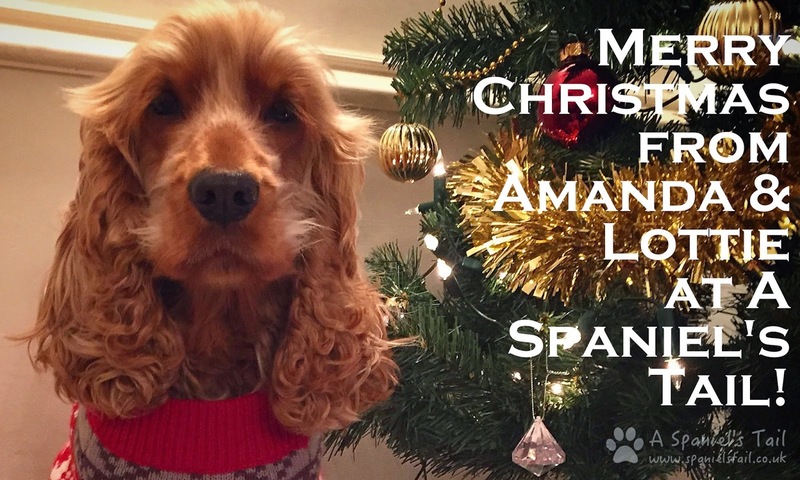 Foods to avoid giving your dog over the festive season......and a seasons greeting! Well, we are finally here - Hooman has been rushing around like a mad thing packing all her Christmas shopping into two days and leaving it as late as possible, but it is Christmas Eve, and tomorrow dogs noses will be a-twitching at the delicious smells coming from the kitchen. Now I am sure that most responsible dog owners out there will be fully aware of the foods that could be toxic (and even fatal) for their dog, but there is no harm in a timely reminder. One of the potentially most dangerous foods, it is not known why some (not all) dogs develop such a dreadful reaction to the ingestion of grapes, leading to acute renal failure. We have heard stories from one extreme to the other: from a dog eating 12 grapes and ending up on a drip at the vets, to a dog who loves them with no apparent effect. We don't think it's worth the risk to find out though! First symptoms of grape toxicity tend to be diarrhoea and/or vomiting (you may see pieces of grape), followed by weakness, not eating, drinking a lot and abdominal pain. If you think your dog has ingested grapes, then call your veterinary surgeon for advice. Really carrying on from the above, the drying of the grapes into raisins and sultanas just increases the concentration of the fruit in whatever food they are in - make sure no well meaning relative is trying to give pooch a little bit of Christmas pud under the table. Now we are not going to say avoid ALL turkey - a little bit of lean meat will probably be very much appreciated by your dog. However, do avoid giving them any skin - it is far too fatty for them, and could lead to digestive upsets, and worse, pancreatitis. Cooked poultry bones in particular can be very dangerous to give to your dog. We love raw chicken wings here - the bones are soft and flexible and can be digested. A great toothbrush for your dog in fact! However, a bones composition changes once cooked and they become brittle and splintery. Giving these to your dog could lead to injury in their digestive tract. Onions and to a lesser extent garlic is also toxic to those of a canine persuasion, causing damage to the dogs red blood cells, with a general rule of thumb being that the stronger it is, the more toxic it is. So if you dish up a little Chrimbo dinner for your dog, leave out the stuffing, and even the gravy if there is onion on it. Again, another commonly known toxin to dogs, caused by the presence of theobromine and caffeine. Similar to the onion rule of thumb above, the darker it is, the more toxic it is. If you think your dog has ingested chocolate, call your veterinary surgeon for advice, particularly if any of the following symptoms are being displayed: vomiting, increased thirst, restlessness, seizures, high temperature, tremors or irregular heart beat. A strange one, but yes, macadamia nuts can have quite a marked effect on your dog. Although unlikely to be fatal, it can cause some distressing symptoms for a while, including hind quarter weakness, low grade tremors, appearance of being in pain and low grade fever. Symptoms tend to abate after 48 hours. Put those Pigs in Blankets down - ham and bacon is way too salty for your dog, and again these tend to be high in fat, so could lead to pancreatitis. We all love a bit of avocado in our salad (or with some smoked salmon, yum! ), but it doesn't go down so well with Fido - it can lead to tummy upsets and pain, vomiting and diarrhoea. Make a request that friends and relatives don't feed your dog any "human" treats. If you give your dog some Christmas dinner, keep it restricted to some lean meat and some veggies. They will love it as much without all the trimmings, and it will be much healthier for them! Keep plates, glasses and cups off the floor - Lottie loves a drop of tea, but keep them out of coffee mugs, and any glasses containing alcoholic drinks. And above all else, we wish you a wonderful and merry Christmas!! Great information, Lottie! Merry Christmas to you and your peeps! Excellent tips. Sharing. 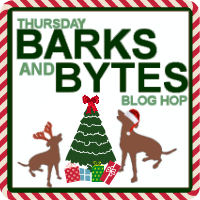 Thanks so much for joining the Barks and Bytes hop and have a very Merry Christmas! Have a blessed and safe Christmas! Merry Christmas - thanks for the reminders! Great tips! Instead of sharing any of our Christmas dinner with the dogs, we got them some special canned food from Merrick for them to enjoy! Safer for them and they love it! Merry Christmas to you from all of us at Wag 'n Woof Pets! Thanks for the reminders Lottie! (Uh oh! We had a few bites of ham yesterday.) Our humans are very careful to put the chocolates out of our reach, though. Hope you and your family had a great Christmas!